Villefranche- sur- Mer, situated on the Côte d’Azur in the far south-east of France, is a delight to behold. This former fishing village is situated on a steep hillside, cascading down to what is considered to be one of the most beautiful bays in the world. It is no wonder that Villefranche property is so highly desirable. A particular feature of Villefranche is the ‘vieille village’ – the old town – home to cobbled medieval alleyways and quaint old Villefranche property. Many of the colourful houses date back to the 13th century and arch over the narrow streets, forming vaulted walkways. A famous example of this is the Rue obscure (the hidden street), so-called because a covered walkway runs for half of its length, hiding the street from view. Villefranche property can certainly be very unique! In fact, history abounds in this small coastal town. The dramatic Citadel (Fort Sainte Elme), built in 1557, now houses a town hall, convention centre and an open-air theatre. It is pleasant to take a stroll along the path below it, which leads down water’s edge or explore its lush gardens. You can also go for an intriguing drive in the ‘moat’, where you will be sure to marvel at the imposing 100 foot-high walls! The 16th century Chapelle Saint-Pierre is also well worth a visit. It has become famous for its murals depicting the life of the saint and that of local fishermen, painted by Jean Cocteau in 1957. Such wonderful natural and man-made scenery have offered a fantastic setting for many films, including Hitchcock’s To Catch a Thief, The Count of Monte Cristo, The Jewel of the Nile and The Bourne Identity, to name but a few. Look out for the beautiful Villefranche property next time you watch! Some of the most lavish Villefranche property can be found in the hills above the town. Beautiful villas and mansions are the order of the day here, and this area is a favourite residential site for celebrities and the aristocracy. 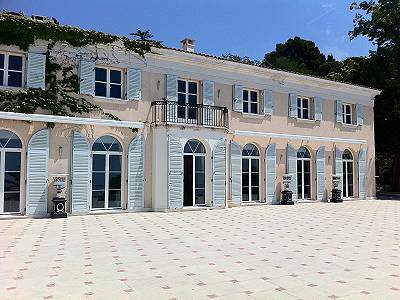 The Villa Léopolda, once the residence of King Leopold of Belgium, is the most exclusive Villefranche property with stunning views down to the bay. Dating from the start of 1900, this cream-coloured villa, set in 20 acres of gardens, is now considered to be the most expensive house in the world! Rental income from your Villefranche property is sure to be high. The old harbour, La Darse, dates back to the 17th century, and is now a marina and the site of an oceanic observatory for scientific research. The bay itself is one of the deepest natural harbours of any part of the Mediterranean, and as such provides safe anchorage for large ships, and many luxurious yachts can often be seen here, alongside the traditional Mediterranean pointus (fishing boats). 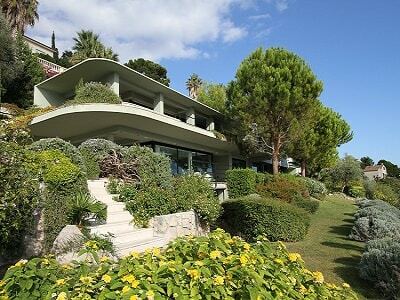 A Villefranche property certainly has much to offer, with nearby sandy beach, La Plage de Marinières, stretching for a kilometre along the North end of the bay. How better to spend your days when visiting your Villefranche property than sitting on the beach and taking in the scenery? Alternatively, whiling away the hours in a beachfront café, with views out to Cap Ferrat is pure bliss. There are many opportunities to explore the area on foot, with some picturesque walks in the hills above the bay. The waters are fantastic for bathing and snorkelling, or why not explore the area by boat? With a Villefranche property all of this is on your doorstep. And let’s not forget that Villefranche enjoys perfect Mediterranean weather to boot! In fact its warm sunny days and temperate nights provide a unique micro-climate, which encourages the growth of a variety of exotic flowers and foliage. This former fishing village has succeeded in maintaining its charm and character in spite of expansion, and you can enjoy a typically French Riviera lifestyle here. Why not sample the local cuisine, delicious produce and wine and shop at local markets? Quality shopping and dining abound. The town’s location makes it perfect for exploring the wider area. The town is 6 km from the City of Nice, separated by hills to the East, and there are frequent train services to nearby Monaco and Cannes. Italy is a mere 30-minute train journey away and the neighbouring quaint fishing village of Banlieu-sur-mer is also worth a visit. There are good, reliable train and bus services, so cars do not have to be a necessity. Connecting you to your Villefranche property is the airport at Nice and links via the Eurostar and TGV. If you are looking for a luxury property in a highly desirable and exclusive location on the French Riviera, then a Villefranche property is waiting for you.